Original sculpture by up-and-coming-artist Yvonne M. Johnson. One ear is perked forward, alert to what is ahead, while the other is cocked back as if he is listening to his rider. This gives him personality as well as a sense of compliance & attention. Calm appearance, nice head-set, relaxed gait. Should do well in various model horse classes. Whether you want him for showing or just simply to own, he is sure to bring you "pleasure". More information & pictures of the sculpture & resin can be seen at http://www.HorseHockey.com/sculptures.htm. "Mosey-On" is to be cast as a resin in a quantity of about 25-50 pieces (total made will be announced later) , by Randy Buckler of "Resins by Randy" (formerly "DaBar Express"). Few if any will be offered unpainted - the vast majority will be sold professionally painted by the artist, to customer specifications. Color, markings, etc will be discussed at time of ordering. Price varies depending upon color requested, please inquire with your preferences to get an estimate. Each resin will come with his own certificate signed by the artist. The pieces will also be individually numbered. Don't take a chance in missing out, reservations are now being accepted for painted pieces! Please keep in mind the sooner you reserve your resin, the higher you are on the list, & the sooner yours will be painted & shipped to you! If you would like to order, or have questions, please contact Yvonne Johnson. 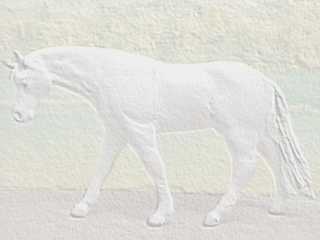 Examples of painted pieces can be viewed on the Customs page: http://www.HorseHockey.com/Customs.htm. Some Artist's Choice colors may be available, noted in descriptions above images. UPDATE! Only 17 pieces have been cast, that or 20 total *may* be it! Only 5 of the pieces have not been reserved or painted as of June 2000, & the artist continues to paint any unclaimed models in her choice of colors as time permits. So if you want a custom painted Mosey-On, hurry & reserve it now! Policies: None of Yvonne's resins are to be changed in any way. Painted pieces must not be repainted, altered, etc. Unfinished pieces (if any) must not be altered (no repositioning etc). CLARIFICATION: This resin is available *EXCLUSIVELY* through Yvonne Johnson only, not any other person or organization! Unless you get lucky & find one on the secondary market from a previous owner (& remember, all of them are painted & signed by Yvonne, serially numbered, & come with a specific certificate of authenticity). ©1999 Yvonne Johnson - please do not copy or use background without written permission!